In 1945, the Navy approached Convair to see what could be done about building an improved flying boat, and Convair came up with the Model 117. It was a very sleek, high wing boat with a single step hull, four Allison T-40 turboprop engines with six blade, contra-rotating props. Each engine developed 5,100 shaft horsepower and 830 pounds of jet thrust. The stabilizing floats were fixed, as there was no room to stow them in the thin, laminar-flow wing. The boat was named the "Tradewind". It first flew in 1950 after a delay of some months because of trouble with the Allison engines. The Navy received it first Tradewind in 1954. The Navy sought to use it as a patrol craft, troop transport, flying ambulance and fuel tanker. As a patrol craft, it mounted 5 pairs of 20 mm guns, two on each side fore and aft, and one pair behind the rudder. The Tradewind could lift 8,000 lbs of stores. It had a range of 3,450 miles without stores. This was the P5Y and it had a much different nose section from the transport version. In the troop transport/ambulance arrangement, it was called the R3Y and could carry 103 fully armed troops or 92 stretcher patients and 12 Medics. It was planned to use it as an airborne landing craft, coming right up to the beach to unload troops and equipment. The tanker model went into the history books in 1954 when it set a transcontinental seaplane speed record of 403 miles per hour utilizing the jetstream. It again set a record in 1956 when it simultaneously refueled four F9F Cougars in-flight. The speed record still stands. Two P5Ys, five R3Y-1s and six R3Y-2 Tradewinds were built before production was terminated. 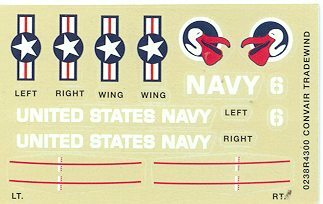 What should have been one of the Navy’s best and most beautiful boats was destined to be very short lived. The Allison T-40 engines were trouble from the start and the problems were never adequately remedied. One of the two original XP5Y-1s crashed and the suspected cause was engine failure. Subsequently, several more of the R3Ys were wrecked and it was judged definitely due to faulty engines. Finally, in 1958 the Navy ordered them grounded and sold for scrap. This is old time Revell at its best. Blue plastic, lots of rivets and the decal locations engraved on the plastic of the wings and fuselage. It also has its required working parts, those being the hinged nose and moveable props. These two features do little to make for a totally authentic model as some leeway had to be made to incorporate the hinges and such. 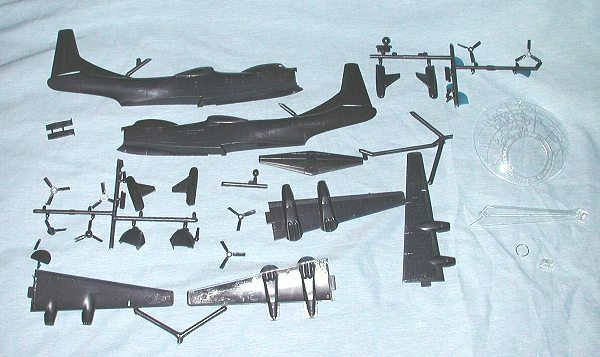 Typical of these older kits (regardless of how recently the kit was produced), the parts seem to eagerly depart from the sprues. This one was no exception. In fact, one of the prop blades had broken off . Unlike most of the reissues of these old kits, this one comes complete with a stand. These stands are highly sought. I only wish that the decal sheet also had the decal for the stand, but it doesn't and there is nothing that can be done about it. There really are not that many parts to the kit. No cockpit, no cargo area detail, no wheels or wheel wells to have to deal with. Undoubtedly the fit won't be the greatest, but it shouldn't be a problem for most of us and certainly no worse than most short run kits. Instructions are a copy of the originals and have three construction steps. Colors for parts are shown where needed yough it is basically dark sea blue with bare metal (or 'gray' as the instructions call it) leading edges. Decals are very shiny and equally poorly proportioned as with the original. My sheet was oddly yellowed so I'm not sure how good it will work. One thing for sure, there are not any aftermarket sheets! This kit has at least two things going for it. One is that there ain't another one of this plane done in injected plastic. The other is the nostalgia factor. Many of us built (well, sorta built), this kit when young 'uns and to find it at a reasonable price is enough to encourage its purchase. I'd say it is good for all ages as I couldn't have been more than 8-9 years old when I built mine! Info gleaned from several web sites.